Gigi Hadid & Little Sis Bella Step Out in Separate Countries | Bella Hadid, Gigi Hadid | Just Jared Jr.
Gigi Hadid is all smiles as she heads to lunch at Marco Polo restaurant on Tuesday afternoon (February 26) in Paris, France. The 24-year-old model went business chic in an oversized black blazer, leggings, and brown boots as she stepped out for the day. A few days earlier, Bella Hadid was spotted making her way through an airport as she arrived in Greece for a photo shoot. Gigi was recently spotted meeting up with another model as they headed to a fashion week party! 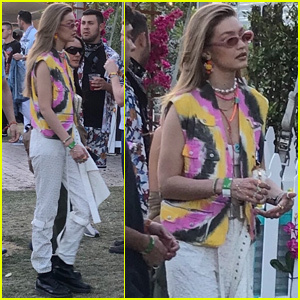 FYI: Gigi is wearing Gigi Hadid for Vogue Eyewear sunglasses.